Dental implants are designed to provide a foundation for replacement teeth that look, feel and function like natural teeth. The person who has lost teeth regains the ability to eat virtually anything and can smile with confidence, knowing that teeth appear natural and that facial contours will be preserved. 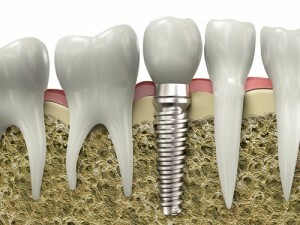 The implants are tiny titanium posts which are placed into the jawbone where teeth are missing. The bone bonds with the titanium, creating a strong foundation for artificial teeth. In addition, dental implants can help preserve facial structure, preventing the bone deterioration which occurs when teeth are missing. Dental implants are changing the way people live! With them, people are rediscovering the comfort and confidence to eat, speak, laugh and enjoy life. If, like many others, you feel implant dentistry is the choice for you, we ask that you undergo a dental/radiographic examination and health history. During these consultation visits, your specific needs and considerations will be addressed by Dr. Brazdo or by an Oral and Maxillofacial Surgeon referred by our practice. Your questions and concerns are important to us and our team will work with you very closely to help make your procedure a success.